If you are a little bit aware of the system that how apps can be run on PC or Mac then you would know that in Android OS, there are so many Android Emulators available that can be used to run Android Google Play Store Apps on Windows PC or on Mac. Similarly, there is iOS Emulator also available in the market which allows users to run any iOS apps on PC or Mac for Free and some are paid one as well. So in this post, we are going to share some best iOS emulators for PC with you so you can easily run iOS apps on PC Windows 10, Windows 8, Windows 8.1 & Windows 7. Below we have chosen best iOS Emulators for Windows PC that will run your favorite iOS apps faster and smoothly. You just need to download and install them on your PC and you are free to use iOS apps and games on PC. iPadian Emulator is counted as one of the best and reliable iOS emulator to run apps on PC with awesome processing speed. It is well-known software to run any iOS games and apps on Windows PC. This is our favorite one, because of it’s easy to use user interface. 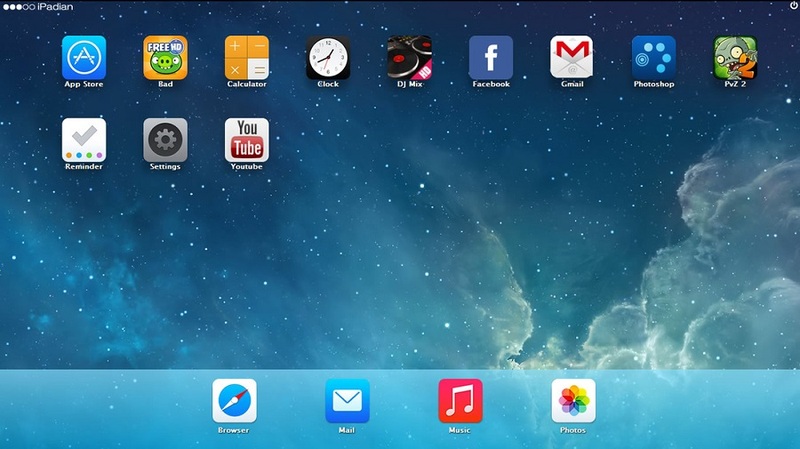 This emulator works with Adobe AIR App which helps this emulator to present you iPhone’s look on your PC. It will replicate the iOS UI on your Windows PC screen. It is another awesome iOS emulator that works as a cross platform to run iOS apps on Windows PC. MobiOne Studio is the emulator which solely made for Windows only. We strongly suggest you try this emulator and enjoy iOS apps on PC. Because it is built on HTML5 and this is why your Windows PC will accept it easily run smoothly even on Windows 7 so that means if you are running old windows OS then you can also run this iOS emulator. This is one of the simplest and easy to use the iOS emulator for all Windows users even a newbie user also can use this emulator to run iOS apps on PC. You need to sync your iOS app pack with app.io and then you can stream your iOS apps via App.io. It is highly recommended by our audience on social media channels and this is why we have added this iOS emulator in this list so you will have one more option to choose from this list. So if you are not satisfied with above options then you can also give it a try to Appetize.io. We hope you find this post useful on “How to run iOS apps on Windows PC” and now you are aware that how you can run iOS apps on Windows PC. If you like these posts then do give it a share on social media handles so your friends can run iOS apps on PC.